It’s a connected world and you’re a connected person, living your life in sync with all the latest and greatest technology available. But what’s that – you’re still watching cable and using a remote control to navigate your entertainment room? It’s time to step into the future and find yourself in the calming sea of IoT. Let’s assume you’re using some form of smart speaker or voice assistant, like Google Assistant or Amazon Echo. If you’re set up with either of these devices, you’re already halfway to an integrated IoT entertainment room. By incorporating assistive tech with additional smart devices, you can control your entire entertainment room using voice commands, apps, or your cell phone. With so many smart devices on the market, it can be a challenge picking the best tech for your space. Luckily, we’ve compiled some of our favorite IoT accessories to put your living room on the cutting-edge. An amazing TV and a top-of-the-line sound bar are just the beginning of your IoT journey. For maximum entertainment, consider ditching your cable provider and picking up a Chromecast or a Fire TV Stick, both of which are excellent tools for amping up your viewing experience. For example, the relatively inexpensive Chromecast allows users to plug in the device, download an app to their phone or computer, and instantly share their favorite videos, streaming media, and photos on their TV screen. This is always a fun accessory when having people over, as everyone can easily download the app and contribute to the entertainment with little effort on the part of the host. But where will you sit while entertaining your guests? How could one seating arrangement possibly conform to every entertainment scenario? Customization is the main selling point for Carlo Ratti Associati’s IoT sofa, the Lift-Bit Furniture System. It may be a bit more advanced than the average homeowner requires, but it’s a leap forward in the world of IoT-enabled seating. The hexagonal seats function separately as stools or they can be combined into larger sofas. Each seat has an independent motor that moves the cushion vertically, offering versatility for those short and tall. The motion is controlled by a smartphone app and through built-in sensors that recognize gestures, like raising or lowering one’s hands. If furniture reading your body language makes you uncomfortable, you may be further dismayed to learn of its other capabilities. The system will also become restless and shape-shift around the room to encourage users to interact with it, which could be somewhat horrifying at first, but likely would become more familiar with time. Though this product is currently only available for pre-order, it has serious implications for the future of furniture. It’s movie night, your chairs have arranged themselves according to your whims, your sound bar is blasting the beats, and it’s time to put that 4K Ultra TV into action with a relaxing movie night. Dim the lights and settle in. Oh wait! You haven’t installed your smart bulbs yet. 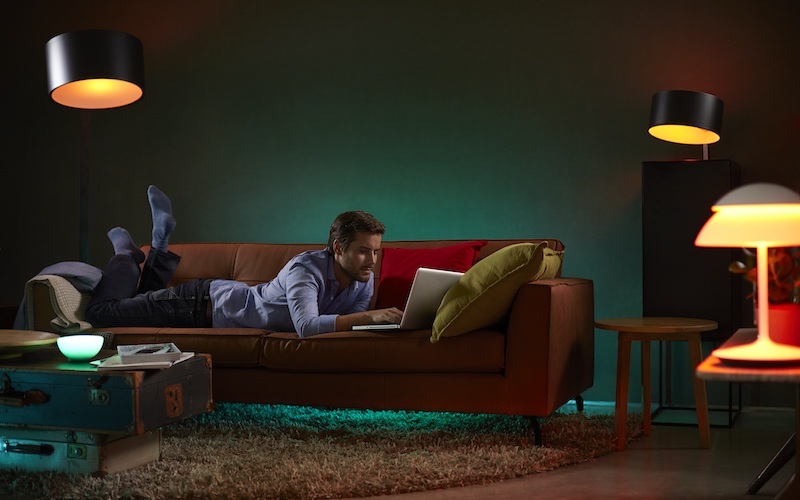 With the Philips Hue Ambiance Starter Kit, or a comparable smart lighting system, you can simply ask your voice assistant to turn on the movie lights and the system will dim your smart bulbs according to your preferred lighting presets. The Philips Kit comes with two bulbs, a wireless dimmer, and a bridge to link the bulbs to the dimmer. Once the equipment is properly connected, the lighting kit will communicate with your voice assistant to provide the perfect ambiance for your upgraded living room. Your new, smarter living room may need some management, preferably a unified interface (or hub) where you can interact with all of your devices at once. The Wink Hub 2 may not be the newest addition to the smart hub family, but it is one of the most user-friendly options on the market. The smart home interface app is one of the hub’s best selling points, offering complete control to the user and a clear visual representation of every device in your network. It’s compatible with a wide array of devices from various manufacturers, including Amazon Alexa, Google Assistant, and Philips Hue, as well as Bluetooth LE, Zigbee, and IFTTT, among others. Voice assistants actually fill many of the roles of smart hubs, but for a fully integrated smart house, an easy-to-use Wink Hub may help fill in the gaps. The Wink Hub 2 also allows the user to create automated sequences called “robots,” which perform a series of actions based on one command. For example, one could trigger the “movie night” robot sequence which would dim the lights, start the popcorn maker, close the blinds, and turn on the TV— all without the user lifting a finger. Now that your home is as smart as you are, you may want to consider adding some safety protocols. The sleek and intuitive Fortigis Cybersecurity AI VPN Router will keep your connection protected. The router creates a secure VPN for total web-browsing privacy, but the most impressive feature is its built-in AI software. The software communicates with other Fortigis routers to assess threats and simultaneously updates the software in your home with new defenses. The tech may prove particularly important when home security features like locks or alarms are incorporated into your smart home setup. Your smart home is now several steps closer to automating even the most mundane details of your life. With rapidly progressing technological innovations and their increasing affordability, why would anyone bother flicking a switch to control their lights or turning a knob to adjust their stereo volume? Integrating IoT-equipped technologies into your living space is less intimidating than it seems, and with some awesome accessories your entertainment room may just be the start of your smart home conversion. Whether you’re tuning in for an evening of Netflix or settling into your smart sofa with some popcorn, all the comforts of home are just a voice command away. Previous article Asteroid or Volcanoes? New Dinosaur Extinction Research Says "Yes"